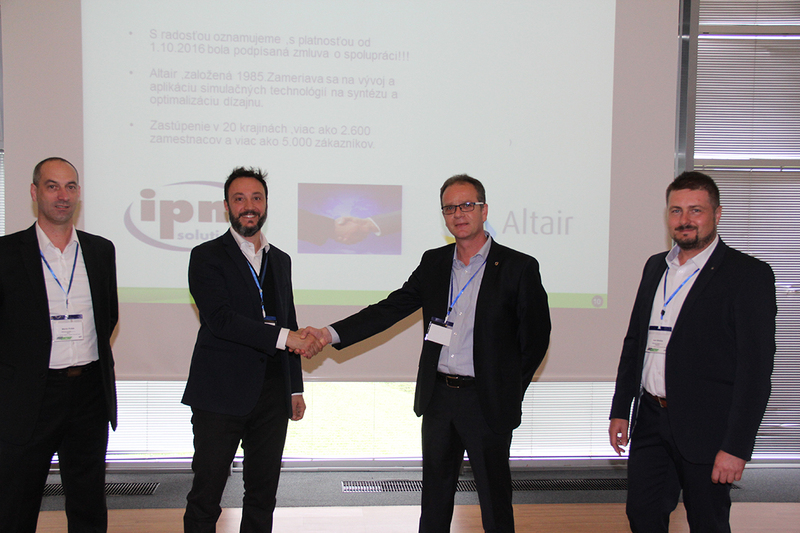 Böblingen Germany/Presov, Slovakia – October 6th, 2016 – Altair has signed a new reseller agreement with IPM Solutions Ltd., which will provide Slovakian customers with local HyperWorks sales and consulting. IPM Solutions covers the customers’ needs within the entire territory of Slovakia. The company has 3 offices, in Presov, Zilina, and Bratislava, which enables them to react quickly to its customers’ needs and requirements. With 18 highly professional employees the company focuses on providing its customers with a broad range of solutions, now including the HyperWorks suite, as well as business and technical support. HyperWorks includes best-in-class modelling, linear and nonlinear analyses, structural and system-level optimization, fluid and multi-body dynamics simulation, electromagnetic compatibility (EMC), multiphysics analysis, model-based development, and data management solutions. Altair supports its customers throughout the world to include Simulation-driven InnovationTM in their product development processes to generate innovative design solutions faster. Coming with a profound background in Computer Aided Design (CAD) and Computer Aided Engineering (CAE), IPM Solutions will be able to serve all needs current and future HyperWorks users in Slovakia might have. “With this partnership we will further increase our presence in Eastern Europe,” said Dr. Pietro Cervellera, Managing Director, Altair Engineering GmbH. "I'm happy about this partnership, because I know we can rely on IPM Solutions' highly qualified team to grow Altair's market share in Slovakia, as well as to offer first class local product support and consulting services to regional customers." IPM Solutions Ltd. was established in 2003 as a follower in sales and support for PTC products in Slovakia. IPM's engineers have more than 20-year experience and their goal is to ensure a continuity in support of solutions for more than 400 customers in Slovakia. The company has offices in Presov, Zilina, and Bratislava, enabling IPM to react quickly to customer needs and requirements. It actively supports the education of students at high and vocational schools and technical universities. IPM also has an onging successful cooperation with Ministry of Education. For more information please visit: http://www.ipmsolutions.sk.